This Barcelona Airport Map shows the Airport & Transport locations . Click the name in the right column to highlight the location on the map. This is probably the most convenient way of getting to and from your resort without paying the higher prices for a taxi. The Aerobus (A1) runs from the all the airport terminals to central Barcelona's Placa de Catalunya , every 15mins from 6:00am to midnight during the week and from 6:30am till midnight during the weekend. Buses run between 5:30am and 11:15pm, and 6:00am till 11:20pm at the weekend. The 105 & 106 local buses also run to and from the airport but take longer, however the 106 runs until 3:20am from the airport and 3:50 to the airport. A overhead walkway, with moving walkway connect the station is to just outside Terminal A. Services operates from the airport to Barcelona between 06:13 23:40, departs every 30 min's. Tickets are only valid for 2 hours after they are purchased. Price guide €2 to Barcelona. Barcelona airport to Sitges, Port Aventura, Salou, etc. There is a frequent coastal service to the resorts. 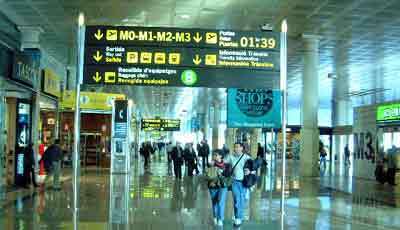 There are extremly frequent trains between the Airport & Barcelona city centre from Barcelona Sants station, one of the main station in Barcelona which is also on the Barcelona underground Metro system. are all represented in Barcelona El Prat airport. Most Desks can be found on the ground floor, in the walkway connecting International and EU Arrivals.